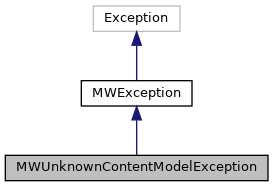 Exception thrown when an unregistered content model is requested. This error can be triggered by user input, so a separate exception class is provided so callers can substitute a context-specific, internationalised error message. Definition at line 10 of file MWUnknownContentModelException.php. Definition at line 15 of file MWUnknownContentModelException.php. Definition at line 23 of file MWUnknownContentModelException.php. The name of the unknown content model. Definition at line 12 of file MWUnknownContentModelException.php. Referenced by __construct(), and getModelId().